On May 19, 2009, the pilot of the television show named Glee (a series about a high school glee club called New Directions and their musical and non-music related stories) premiered in the United States. There was almost instantaneous success on multiple levels and the rest is history. Getting a song performed by the cast of Glee (or a guest performer on the show, such as Gwyneth Paltrow) can mean a lot more than being heard by from 11 million to 24 million viewers in the United States and millions more in countries outside the United States. Because of the association with the Glee brand, one performance in an episode of the television series can lead to a virtually unlimited number of new money making licensing opportunities throughout the world because of the multi-platform universe that is today’s and tomorrow’s entertainment industry. This article begins with the initial license negotiation to put a copyrighted song into the television episode. Then the article describes the various licensing activities that can occur because of the initial or subsequent broadcasts, and the money that can be made both in the short term and long term not only from the Glee cast version but also for the song itself and the versions as recorded by the original recording artist or other recording artists. Once a song is selected for use in an episode of Glee, the show’s producer (many times via a music clearance company or in house staff) contacts the music publisher that controls the composition and requests permission to include the song in the series. As with virtually all uses of musical compositions in audio visual productions in the United States (e.g. television, motion pictures, video games, etc. ), the producer must secure permission via a negotiated license (known as a “synchronization” license) since there are no statutory rates or compulsory license schemes in this area. And yes, a music publisher can, with few exceptions, refuse to license a composition if it so chooses. Depending on the provisions of the underlying agreement between the songwriter and music publisher, the writer may also have approval rights over certain types of uses as well. This initial request states the title of the song and the identity of both the songwriter and music publisher. As with all television license requests, there is a brief scene description so that the publisher is able to see the actual context (e.g., the Glee cast sings the song in the gym. sung during a dream sequence or sung by a substitute teacher, etc.) in which the song is used as well as the projected timing and type of use (e.g, visual vocal/ full use or background instrumental/ not more than 2 minutes/over the closing credits, etc.). All Media (excluding theatrical) now known or hereafter devised, worldwide in perpetuity: $_________. It should be noted that the value of the above all media licensing scheme request is that it allows the producer, for a one-time fee, to distribute the series in virtually every distribution platform including all forms of television, home and personal video, etc. Virtually the only exclusion is the release of the episode as a theatrical motion picture. Option for out-of-context trailers, advertisements and promotional programs (but expressly excluding any cross promotion) to advertise the series worldwide in any and all media (excluding theatrical) now known or hereafter devised for the period of eighteen months. $______. Option for out-of-context advertising and promotion in All Media – United States, its territories and possessions, up to 0:30 - $_____per week. For informational purposes, license requests do change depending on the success of the series and the following represents alternative approaches to licensing when a show first starts off. As you will see, many times there are more options involved in a request during a series’ first or second season before its future becomes more certain. This licensing strategy gives producers a less expensive way to secure the music that they want to use without having to immediately commit to the more expensive “all media excluding theatrical” type of license requested by successful series. a) All Media (excluding theatrical) now known or hereafter devised, worldwide in perpetuity. b) 5 Years All TV Media now known or hereafter devised, including internet streaming (linear only) worldwide. c) Perpetuity All TV Media now known or hereafter devised, including internet streaming (linear only), worldwide. d) Digital Downloads-Unless or until the All Media option is exercised, an option for digital downloads of the entire episode (linear only) for sale or promotion. (For clarity, commercial DVDs and other forms of physical home video devices are not included), worldwide, 1 year commencing from the initial download availability. All Media (excluding theatrical and All TV Media previously licensed in perpetuity) now known or hereafter devised, worldwide in perpetuity (exercisable within 24 months after initial broadcast of the episode). Out-of-Context advertising and promotion-United States, its territories and possessions, All Media up to 0:30; $_____ for 30 days or $_____ per week; exercisable no later than 12 months after the airdate of the final episode of the production. The quote confirmation containing the publisher’s requested dollar amounts for each type of media and/or option request (this is an area of negotiation between the parties) is then returned to the producer via email or fax and is usually valid for ninety (90) days. If the song is actually used in the show, the producers send a confirmation to the publisher with a request for a formal license to be issued. The request is many times sent shortly after the episode has been broadcast. The license is then issued; it is signed by both parties; and the fees are paid to the music publisher who shares the monies with the songwriter per the terms of the music publishing agreement. Obviously if there are options in the synchronization agreement, the fees for each of the various options will be paid as the options are exercised within specified contractual timeframes. The actual television synchronization license is usually not more than a 5 page contract which covers such areas as the series name, episode number or episode name, the title, writer(s) and publisher(s) of the composition, as well as their performance right affiliation (e.g., ASCAP, BMI, SESAC, SOCAN, PRS for Music, APRA, GEMA, SACEM, etc. ), the territory of distribution, the term/duration of the license agreement, the nature of the use in the episode, the approved licensed media, the license fee as well as option fees for additional media and/or extension of initial media, if applicable, domestic and foreign performance licensing issues and procedures, assignment of rights, ownership warranties and representations, indemnifications issues, cure provisions, remedies and governing law. In addition, the license agreement provides that the show’s producer will send the music publisher a copy of the music cue sheet for the episode usually within sixty (60) to ninety (90) days of the broadcast of the episode. This is vitally important since the music cue sheet describes how each piece of music (songs, score, and theme) was used in the episode. It should be also provided that the producer is obligated to send the cue sheet for the episode to the applicable performance rights society. The information on these music cue sheets forms the basis on which writers, lyricists, composers, and music publishers are paid by the performance right societies around the world for broadcast and/or digital transmission of the series, so it is essential to review these cue sheets to make sure that they contain the correct information. Since timing (e.g. minutes and seconds) and how music is used (feature, background, etc.) in an episode dictates for many countries how the royalties are calculated, review by the music publisher and/or songwriter (and, if applicable, correction of any error) is an essential element in making sure that royalties are calculated correctly with respect to both United States societies and those around the world. Because of Glee’s popularity, there are a number of income producing areas that come into existence as a direct consequence of the episode being broadcast in both traditional, internet or other media. For example, there are digital track downloads, album sales, ASCAP, BMI, and SESAC songwriter and publisher performance royalties for airings of the program in the U.S., foreign performance royalties for broadcast of the show outside of the U.S., merchandise, print, and ringtones, among others. Since the Glee cast versions are available for download from iTunes, many of the songs sung during the episode generate immediate download sales during the first week after the broadcast of between 50,000 to over 200,000 per song (“Teenage Dream” which achieved #1 on the SoundScan digital song charts being in the latter category). [ii] In the United States, the music publisher will be paid a 9.1 cent statutory mechanical royalty for every download sale, resulting in from $4,550 to over $18,200 in music publisher/writer royalties per composition for the initial one week alone (these monies are known as mechanical royalty income). This statutory mechanical royalty rate is the result of a 2008 Copyright Royalty Board decision and is effective through 2012. [iii] Many Glee versions continue on the charts for weeks after the episode’s initial broadcast and can achieve aggregate downloads of over 600,000 (e.g., the Gwyneth Paltrow version of “Forget You” selling over 600,00 individual track downloads in the United States over its multi-month chart activity period). In addition to the Glee cast versions, there are albums being released featuring Glee cast members as individual artists. One example is Matthew Morrison’s solo album ( his character in the show is Wil Schuester who is the teacher who directs the glee club) which came on the U.S. charts at #24. Since Glee is a worldwide success story, there are substantial downloads and physical sales occurring outside the United States. Other than Canada, (where the rate is 8.3 cents for physical product and 12.2% for downloads), mechanical royalty rates are based either on a percentage of the wholesale or retail price of an album or track. For example, in the United Kingdom, the rate payable to music publishers is 8.5% of the published price to the dealer (PPD) for physical sales and 8% of gross revenue for digital sales. [v] It should be noted that the 12.2% Canadian and 8% U.K. digital download rates represent a combined mechanical and performance (reproduction and communication right in some countries) license. One example of sales activity outside the United States is the “Glee The Music Volume 4” album which entered the U.K. album charts at #4 and the Gwenyth Paltrow/Glee cast versions of the “Singin’ In The Rain”/”Umbrella” mashup and Cee-Lo Green’s “Forget You” which debuted on the U.K. digital singles charts simultaneously after the broadcast of the episode which used the songs. Another example is the “Glee: The Music Presents The Warblers” album which entered the U.K. sales charts at #7. In the U.S. the three U.S. performing rights organizations (ASCAP, BMI and SESAC…which are sometimes referred to as PROs) collect in the area of 2 billion dollars in receipts pursuant to the performance right of the Copyright Act. These organizations negotiate licenses with the users of music (radio, broadcast television, cable, websites, airlines, live performance venues, etc.) collect the negotiated or court set license fees and distribute the money back to the songwriters, composers and music publishers who have performances in each of the licensed media. The broadcast television and cable services pay in the area of 600 million dollars per year in license fees to the U.S. PROs for the use of music on broadcast television and cable. It is important to note that each of the three organizations has very different payments for different types of music uses on a show. Visual vocals and visual instrumentals (as is the case with most music use on Glee) are normally the highest paid type of performance with theme songs and underscore many times paid at a lesser rate. There are also provisions which adjust royalties depending on the timing of the use of the composition, the time of day when the episode is broadcast and the song’s past history of performances. In the radio area, stations pay ASCAP, BMI and SESAC in excess of 500 million dollars a year. If a song from Glee becomes a major traditional over the air radio chart song, songwriter and music publisher income could easily exceed $800,000 in the initial nine months of activity. Since Glee is syndicated in numerous foreign countries including Canada, the United Kingdom, Australia/New Zealand, Japan, India, France, Ireland, the Philippines, South Africa and Russia to name a few, there are additional performance royalties earned by the writers and music publishers of the songs performed in each episode that is broadcast. Close to 600 million dollars is forwarded each year by foreign performance rights organizations to ASCAP, BMI and SESAC for foreign performances of U.S. writers’ works with a large portion of that attributable to musical works contained in motion pictures and television series distributed in territories outside the United States. It should also be mentioned that these foreign societies also license and collect royalties for Internet performances and radio performances of the Glee cast versions as well as live concerts or touring events related to the series, among other performance right based uses. If a Glee cast recording of a performance from the series is turned into a ringtone in the United States, the songwriter and music publisher, in the aggregate, will receive a statutory royalty of 24 cents per mastertone download. This rate was established via the aforementioned 2008 Copyright Royalty Board proceeding and decision. [viii] Outside the United States, ringtone royalties are usually based on a percentage of the retail price to the consumer. For example, in the United Kingdom, the rate is 12%. In addition to the ringtone area, ringbacks can also generate royalties. There is no statutory rate in the United States for ringbacks (as in the case of ringtones) and songwriter/music publisher royalties are usually calculated as a percentage of the retail price with a penny floor pursuant to negotiated agreements (most times on a most favored nations basis). In the print area (an area which is much more expansive than what the word usually means to people), the Glee franchise offers a multitude of configurations through its print distributor, which focus on both the vocal and instrumental aspects of the compositions featured in the series in physical and digital distribution formats. For example, there are guitar songbooks, easy and intermediate piano songbooks, piano vocal collections, pop choral series (many with accompanying CDs) both in folio and individual song configurations, digital downloadable choral product, instrumental play-along folios with accompanying CDs for individual instruments such as violin, clarinet, alto sax, trumpet, cello and trombone, medley collections, a mash-up series of songs performed in the show with accompanying CDs, concert band folios with score and parts, contemporary marching band individual folios, a capella product and rhythm section parts for various compositions in downloadable format. Another valuable area which takes advantage of the Glee brand is electronic toys which use music from the series. For example, there is a Glee-tastic Mic which enables a person to sing along with the cast of the show (songs included being “Hello Goodbye” and “You Can’t Always Get What You Want”). There is also a Glee Magic 8 Ball, which is able to answer questions about the series (including a performance by the cast of “You Can’t Always Get What You Want”) via an audio chip. In addition, there is the Electronic Jammin’ Journal which uses the Glee theme song while featuring quotes from the show, among other items. As with other electronic toys, the licenses are royalty generating arrangements based on a negotiated penny rate per toy sold with an advance based on projected sales. In addition to exposing compositions in a new way to a new audience (including music supervisors, directors, etc. of other audio visual projects), the Glee franchise also produced a 3D motion picture entitled “Glee: The 3D Concert Movie” based on the 2011 North American live concert tour by the Glee cast. Such a project required additional synchronization licenses (and fees) due to the fact that it is a motion picture and also opened up a new source of income outside the United States which does not apply to television shows; that of songwriter and publisher income based on the success of the film in theatrical distribution throughout the world. To illustrate, performance right societies outside the United States license motion picture theatres and collect a percentage of the box office receipts for every film distributed to the general public. In turn, these societies send these monies in the form of royalties to the performance right organizations representing the writer who wrote the song and/or music/lyrics (e.g., for U.S. writers, ASCAP, BMI or SESAC depending on affiliation). With respect to the publisher’s share of performance income, such is usually sent by the local foreign society directly to the music publisher’s subpublisher in the applicable territory which then remits such monies to the original publisher in the United States after deducting its administration fee. Although the theatrical distribution performance license fees vary by country, an overall guide would be approximately 1% of the box office receipts. Once again, the brand has opened up exposure and licensing opportunities for musical compositions identified with the series regardless of whether or not the Glee version is used in the new audio visual work. Glee has also specialized in introducing compositions to its audience by combining songs into mashups which are sung by the cast. All of these mashups are approved by the music publishers which own the individual compositions used in the mashup and are licensed as two separate compositions but with the proviso that they are being combined into a new work. Some examples are the Glee mashups using “Thriller” and “Heads Will Roll” for the Super Bowl episode, “Singin’ In The Rain” with “Umbrella” and “I Feel Pretty” with “Unpretty”. In virtually all cases, uses of the mashup outside of its use in the particular episode are permitted only if the copyright owners of both compositions approve and license their applicable shares separately (or in concert with one another). After the close of the second season of the series, a concert tour featuring the Glee cast occurred which opened up another revenue generating area for the songwriters and publishers of songs performed on the show which were also performed during the tour. For example, ASCAP pays royalties for all musical compositions performed in live concerts for the 200 Top-grossing concert tours as well as certain specific concert venues. BMI keeps a data base of the Top 300 concert tours and/or concert events/festivals so that royalties can be paid. SESAC makes payments based on most U.S. reported live performances. It is important to note that set lists must be provided to identify the songs being performed so that royalties can be properly distributed. In addition, since performance right societies outside the United States also license live performances, writer and publisher royalties can be earned from concert tours in foreign countries as well. If a series is a success, the producers may create or help develop an additional program or series that is directly related to the series or an aspect thereof. With respect to Glee, the related program that was broadcast at the end of the second season had to do with a reality concept which followed a number of performers in their journey to secure a role in upcoming Glee episodes. The series was called “The Glee Project” and was broadcast on the Oxygen cable network. As with other television programs, there are synchronization and personal/home video fees (in addition to other option based fees which may be exercisable by the producer under the synchronization license) as well as performance royalties for broadcast via all distributions channels including the Internet plus all the other possible income producing areas that may occur as a result of a song being included in a television program…especially one as popular as Glee. As with any song that becomes successful or receives substantial exposure, other income opportunities can open up for the songwriter and music publisher. For example, the song may be used as an app; a clothing company may put the lyrics on a pair of jeans; an advertising company may use it in a commercial; a Glee motion picture might be produced using songs from the television show; a novelist might use the lyrics in a book; a Broadway show producer might select the song for inclusion in a theatrical musical; other recording artists may record the song; a film producer might license it for a film; a television producer might use it in another television program; a greeting card company may license the song as part of a physical or digital card: a video game developer might use it as part of a video game, etc. Each of these additional forms of exploitation (other than an area covered by a compulsory license) involves separately negotiated license agreements. The list of possibilities is never ending and ever expanding. Even though Glee has used pre-existing compositions from all different genres and eras (from “ Bridge Over Troubled Water” , “ Getting To Know You”, and “ Start Me Up” to “ Dancing Queen” , “ Stop In The Name Of Love” and “ Just The Way You Are” , it has also featured newly written compositions designed specifically for performance on the show. Examples are “Get It Right”, “Hell To Know” and “Loser Like Me” from episode 16 of Season 2 of the series. All of these songs reached the digital track charts in the United States after the episode’s broadcast which proved that the Glee brand not only works with existing compositions but with “ newly written for Glee” compositions as well. Another beneficial by product of the Glee brand is how it can focus its audience on a particular artist, writer or album in a particular episode…a focus which not only gives the Glee cast great music to perform but also re-invigorates catalogues of existing songs (and the original masters or cover versions which featured those songs ). One example is the Glee episode that featured songs from Fleetwood Mac’s 1977 multi-platinum “Rumours” album. Songs such as “Don’t Stop”, “Songbird”, “Go Your Own Way” and “I Don’t Want To Know” were featured . This not only generated download chart activity of the Glee cast individual track versions but also generated additional interest in the original Fleetwood Mac album (which entered the iTunes download charts at #2 after the episode was broadcast) and the individual compositions contained on that album. The same can be said of the episodes concentrating on songs by writer artists such as Lady Gaga and Madonna. Having a musical composition sung by the Glee cast or a non-cast member featured in the series (e.g., Gwyneth Paltrow) represents one of those ultimate licensing opportunities which have positive financial effects far beyond the initial broadcast of the series episode or signing of the television synchronization license…opportunities which benefit not only the Glee cast version but also the original recording and other recordings of the composition. As we have seen, Glee is a brand which is truly a goldmine in terms of chart and financial success (which can easily turn platinum or multi-platinum) for songwriters and music publishers (as well as record companies which control the original masters of the songs used in the series as well as the record companies that control the Glee cast masters) because of not only the money it generates but also the short term and long term opportunities it creates. Additionally, since the series will continue to be distributed for years into the future via multiple platforms…long after the final first run episode has been completed…new licensing and commercial exploitation opportunities will continue to appear not only for the series itself but for the songs featured in each episode. market, Glee stands out in a very unique way since it not only successfully markets its own brand but also has a significant influence over other non-Glee brands since it positively impacts a wide range of songs and artists not necessarily controlled by or identified with the television series. In other words, it’s a win win for everyone. © 2012 Jeff Brabec, Todd Brabec. All rights reserved. 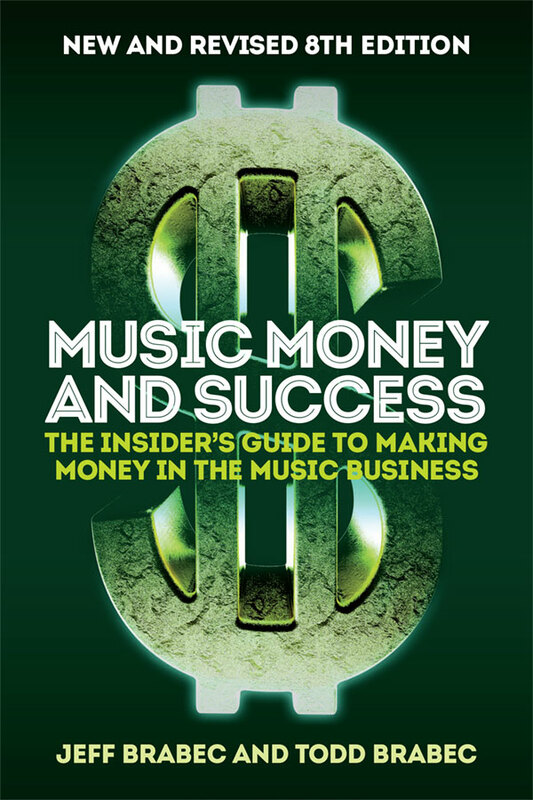 [i] See Jeffrey Brabec and Todd Brabec "Music Money And Success: The Insider's Guide To Making Money In The Music Business" (7th Edition/2011) (Schirmer Trade Books/Music Sales) pages 197-223. See also www.musicandmoney.com for additional information on licensing issues. [ii] According to Nielsen SoundScan. [iii] U.S. Copyright Royalty Judges decision of October 2, 2008. "In the Matter of Mechanical and Digital Phonorecord Delivery Rate Determination Proceeding". Rate determination under 17 USC Section 803(b) and 37 C.F.R. Section 351. [iv] According to Nielsen SoundScan. [v] UK Copyright Tribunal decision/July, 2007. "In the Matter of a Reference Under the Copyright, Designs and Patents Act of 1988 Between the British Phonographic Industry, Yahoo and AOL and MCPS, PRS and the British Academy of Songwriters. [vii] See Jeffrey Brabec and Todd Brabec "Music Money And Success: The Insider's Guide To Making Money In The Music Business" (7th Edition/2011) (Schirmer Trade Books/Music Sales) pages 432-441, 443-444. [viii] U.S. Copyright Royalty Judges decision of October 2, 2008. "In the Matter of Mechanical and Digital Phonorecord Delivery Rate Determination Proceeding". Rate determination under 17 USC Section 803(b) and 37 C.F.R. Section 351.